When economic central planners were hoodwinked by, or partner with ecological central planners, one result is lousy economic policy based on crystal-ball predictions. Like this high oil, LPG, coal taxes under TRAIN 1. Dutertenomists believed that world oil prices would never rise high anymore partly because they thought that world demand for oil will flatline or decline soon as more e-cars, e-bikes, e-buses come in. Of course the major reason is they want more transfer of money from private/household pockets to government pockets while they help "save the planet." Here is an example, economic central planners thought that ecological central planners like UN-Al Gore-CCC, etc would be so right in predicting declining world oil demand and hence, low/stable world oil prices. I talked to one DOF Junior staff and that's what he told me, DOF and the rest of Dutertenomics were thinking that supply-demand of gas engine cars will decline as demand for electric cars will rise fast. Eh 1980s ko pa narinig yang e-cars e-cars na yan, after 3-4 decades mostly press release lang and far out from being a really useful stuff. The reality is the opposite of what the ecological central planners say -- demand for oil-propelled vehicles, planes, boats, will keep rising. 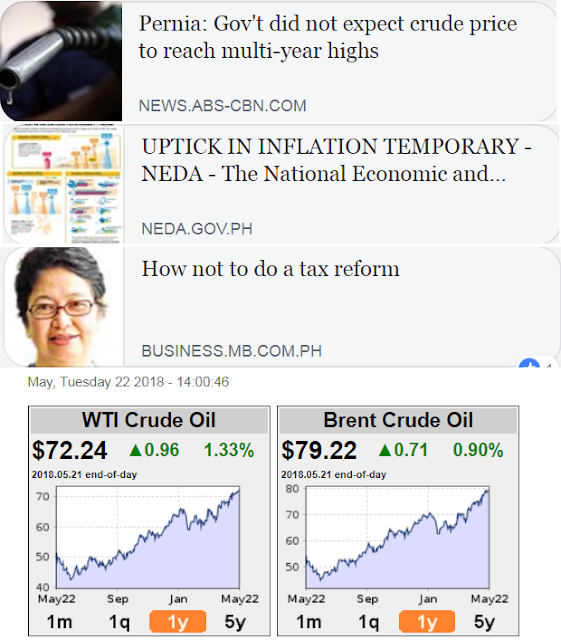 Dutertenomists (DOF, DBM, NEDA, DTI, BSP) were so certain then when TRAIN was still a bill, that the inflationary impact of higher oil prices due to high oil taxes would be only 0.7% max. As of April 2018, ytd jump in inflation was 1.2% or nearly double their projected rates. So NEDA issued another prediction last May 04 that look like based on crystal-ball de manghuhula again. I said "crystal-ball prediction" by NEDA of inflation tapering off because govt, via LTFRB and Malacanang, with implicit silence of all Dutertenomists, will not grant any fare hike adjustments. Govt is good in sucking taxes from owners and operators of jeepneys, taxi, UV express, buses but will never grant fare adjustments. If the Dutertenomists are responsible and honest, they should voice out granting the fare hike adjustments now and find other means to minimize the impact. Wala eh, pasimple lang. Then January 2019 is near, round 2 of tax hikes for oil and coal, also LPG I think. Inflationary pressure will build up as early as December or Nov. 2018. Then tatahimik naman mga Dutertenomists for any fare hikes? "Inflation, as we have predicted, will be higher in May, June and July but will eventually go down but still at a high level. It will average close to BSP target band, so that should not lead to suspension," Ang said. He also cautioned against efforts to suspend the implementation of the tax reform law, saying this would affect the country’s credibility as a now investment grade nation. "TRAIN Law cannot be reversed because the cost to economy and credibility is larger," he said, adding that TRAIN is a package for economic growth. "If you suspend it, where will you get the revenues to fund growth and what will investors and ratings agency think." I agree with Alvin there, I do not support the suspension of TRAIN 1. What I support is that many ugly and inflationary provisions of TRAIN 1 like high energy taxes (oil, LPG, coal), sugar tax, should be reversed and removed via TRAIN 2. Du30 needs more TRAIN money so that the huge and many China loans that his administration will contract will be paid someday. I doubt if any of the Dutertenomists will admit the hidden agenda of build-build-build via loans-loans-loans from the China communist government. "Government may have been too busy or too excited to collect the revenues from TRAIN that it forgot how important it is to prepare for its implementation. How a tax is implemented is equally important, if not more important, than the tax policy itself. Bad administration means bad policies. All the excel formula on the results of the TRAIN on prices and income distribution will come to naught when producers and taxpayers are left on their own to adjust to changes in tax rules." -- Nini Guevarra, former DOF USec. China Watch 27, How many islands the PH has?